Description: spriterip.py is a Python program for extracting sprite images from Commodore 64 memory snapshots as produced by the VICE Commodore 64 emulator. 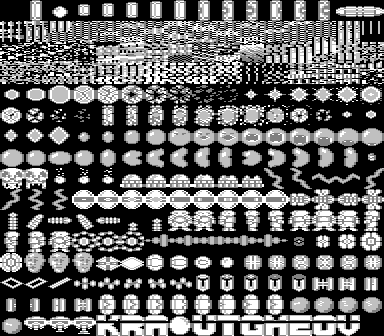 It reads a memory dump and writes 4 PGM files, each consisting of one of the C64's 16K memory banks interpreted as 256 sprites. Since the C64's video chip can only access one memory bank at a time, most (but not all) software will have all sprites in one bank. Once the image file is written, you can use an image editor such as The GIMP to extract sprite images. The sprite definitions do not actually contain palette information, and as such are written in four levels of grey; you may need to hand-colour them to make them look realistic. spriterip accepts a number of options: -o is used to specify the output filename base; a bank number is appended to this to create four filenames. By default, spriterip assumes that sprite data is in 4-colour mode, with double-width pixels; the -m flag tells it to interpret sprite data as monochrome. The -v flag increases the verbosity of output messages. spriterip is a quick-and-dirty hack; its memory dump parsing is somewhat primitive and assumes that the RAM image is at a specific offset in the file. There is no guarantee that it will work with future versions of VICE, though it works well with 1.16 on Linux. spriterip needs a recent Python interpreter (it was developed on 2.3, though may work on earlier versions) and the Python imaging library. It, of course, comes with no warranty, express or implied, and is unsupported. If it does what you want, good for you; if not, too bad.